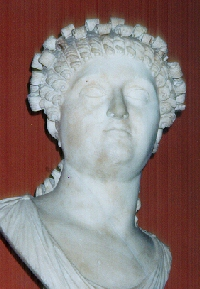 Valeria Messalina was the third wife of Claudius in 38 AD. Messalina was only 18 years old at the time of her marriage to Claudius when he was 50. She bore Claudius two children, Tiberius Claudius Germanicus, later called Britannicusfollowing his father’s conquest of Britain, and Octavia, who was betrothed to the future Emperor Nero. Messalina became a ruthless Empress who plotted and manipulated Claudius and had rivals executed including a number of distinguished senators. One of her victims was Julia Livilla, the sister of Caligula, who came back from exile in 41 only to be sent back again to be murdered. In addition to the plots and murders of Messalina, she is perhaps best known to history for her adulteries. Her lovers were numerous from influential senators to mere actors. Her orgies were famous but she finally went too far. 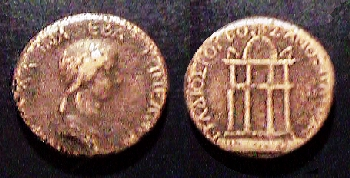 While Claudius was at Ostia, she openly married one of her lovers Gaius Silius in October of 48 AD. It was most likely an open attempt at a coup d’etat, but certainly she could not have been thinking clearly. Confusion emerged with many fearing to take sides. Claudius’s faithful secretary, Narcissus saved the day by rushing Claudius to the safety of the praetorian camp where Silius was dragged before him and executed. Messalina was also executed without given the opportunity of an audience with Claudius fearing that she would once again manipulate him in her favor.